For other uses, see Parallel Lives (disambiguation). As he explains in the first paragraph of his Life of Alexander, Plutarch was not concerned with writing histories, but with exploring the influence of character, good or bad, on the lives and destinies of famous men. He wished to prove that the more remote past of Greece could show its men of action and achievement as well as the nearer, and therefore more impressive, past of Rome. His interest was primarily ethical, although the lives have significant historical value as well. 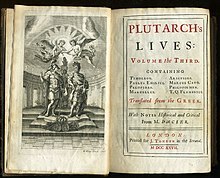 The Lives was published by Plutarch late in his life after his return to Chaeronea and, if one may judge from the long lists of authorities given, it must have taken many years to compile. The chief manuscripts of the Lives date from the 10th and 11th centuries, and the first printed edition appeared in Rome in 1470. Thomas North's 1579 English translation was an important source-material for Shakespeare. Jacob Tonson printed several editions of the Lives in English in the late 17th century, beginning with a five-volume set printed in 1688, with subsequent editions printed in 1693, 1702, 1716, and 1727. The most generally accepted text is that of the minor edition of Carl Sintenis in the Bibliotheca Teubneriana (five volumes, Leipzig 1852-1855; reissued without much change in 1873–1875). There are annotated editions by I. C. Held, E. H. G. Leopold, Otto Siefert and Friedrich Blass and Carl Sintenis, all in German; and by Holden, in English. Several of the lives, such as those of Epaminondas and Scipio Africanus, are lost, and many of the remaining lives are truncated, contain obvious lacunae and/or have been tampered with by later writers. Plutarch's Life of Alexander is one of the few surviving secondary or tertiary sources about Alexander the Great, and it includes anecdotes and descriptions of incidents that appear in no other source. Likewise, his portrait of Numa Pompilius, an early Roman king, contains unique information about the early Roman calendar. Plutarch has been criticized for his lack of judicious discrimination in his use of authorities, and consequent errors and inaccuracies, but he gives an abundance of citations and, incidentally, a large number of valuable pieces of information, which fill up numerous gaps in historical knowledge obtained elsewhere. He has been praised for the liveliness and warmth of his portrayals, and his moral earnestness and enthusiasm, and the Lives have attracted a large circle of readers throughout the ages. Plutarch structured his Lives by alternating lives of famous Greeks with those of famous Romans. After such a set of two (and one set of four) lives he generally writes out a comparison of the preceding biographies. The table below links to several English translations of Plutarch's Lives available online; see also "Other links" section below. The LacusCurtius site has the complete set; the others are incomplete to varying degrees. There are also four paperbacks published by Penguin Books, two with Greek lives, two Roman, rearranged in chronological order and containing a total of 36 of the lives. Dryden is famous for having lent his name as editor-in-chief to the first complete English translation of Plutarch's Lives. This 17th-century translation is available at The MIT Internet Classics Archive. These translations are linked with D in the table below; those marked (D) in parentheses are incomplete in the HTML version. The full text version (TXT) of the English poet, Arthur Hugh Clough's revision of Dryden's translation is available (via download) at Gutenberg. These translations are linked with G in the table below. These translations are linked with L in the table below. These translations are linked with LV in the table below. The Lives available on the Perseus website are in Greek and English according to the Loeb edition by Bernadotte Perrin; and/or in English according to an abbreviated version of the Thomas North translations. This last edition concentrates on those of the Lives Shakespeare based his plays upon: Thomas North's translation of most of the Lives, based on the French version of Jacques Amyot published in the 16th century, preceded Dryden's translation mentioned above. These translations are linked with P in the table below. All dates are BCE unless otherwise stated. ^ The last line of the table contains the four "unpaired" lives, as mentioned above. 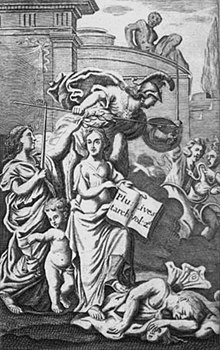 ^ Though the majority of the Parallel Lives were written with the Greek hero (or heroes) placed in the first position followed by the Roman hero, there are three sets of Lives where this order is reversed: Aemilius Paulus/Timoleon, Coriolanus/Alcibiades and Sertorius/Eumenes. ^ At the time of composing this table there appears some confusion in the internal linking of the Perseus project webpages, responsible for this split in two references. Of the biographies in Parallel Lives, that of Antonius has been cited by multiple scholars as one of the masterpieces of the series. In 1895, George Wyndham wrote that the first rank consists of the biographies of Themistocles, Alcibiades, Marius, Cato, Alexander, Demetrius, Antonius, and Pompey. Peter D'Epiro praised Plutarch's depiction of Alcibiades as "a masterpiece of characterization." Academic Philip A. Stadter singled out Pompey and Caesar as the greatest figures in the Roman biographies. ^ James Romm (ed. ), Plutarch: Lives that Made Greek History, Hackett Publishing, 2012, p. vi. ^ a b c Rines, George Edwin, ed. (1920). "Lives, Parallel" . Encyclopedia Americana. ^ Shakespeare's Principal Plays. Century Company. 1922. ^ Stadter, Philip A., ed. (2002). Plutarch and the Historical Tradition. Routledge. p. 159. ISBN 1134913192. ^ Plutarch (1906). Plutarch's Lives of Coriolanus, Caesar, Brutus, and Antonius: In North's Translation. Translated by North, Thomas. Clarendon Press. ^ Plutarch (1895). Plutarch's Lives of the Noble Grecians and Romans, Volume 1. Translated by North, Thomas. D. Nutt. ^ D'Epiro, Peter (2010). The Book of Firsts: 150 World-Changing People and Events from Caesar Augustus to the Internet. Anchor Books. p. 38. ISBN 0307388433. ^ Brice, Lee L.; Slootjes, Daniëlle, eds. (2014). Aspects of Ancient Institutions and Geography: Studies in Honor of Richard J.A. Talbert. BRILL. p. 38. ISBN 9004283722. University of Chicago English text of Plutarch's Parallel Lives.